The search is on for Little Miss North America 2018. 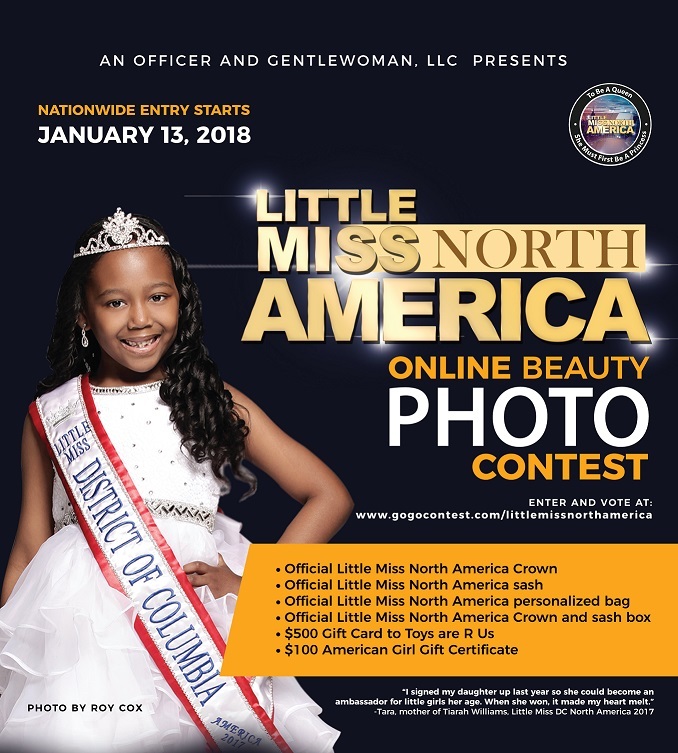 The contest, produced by An Officer and Gentlewoman, LLC, is an online beauty contest for girls ages 7-12 years old who live within the 50 states or District of Columbia. Parents can enter the children until April 1st. WASHINGTON - Jan. 12, 2018 - PRLog -- A portion of the funds raised will go to a charity that focuses on the health and welfare of children. This year's recipient is Victoria's Voice, a charity that focuses on reducing drug experimentation amongst children. The Little Miss North America has two levels: the state level and the National level. Parents can sign their children up starting on January 13th on the website. The public votes on each child's photo. Once the online voting is over, the top 3 contestants with the most votes in their state will be awarded the title of: State Winner, 1st Runner-up and 2nd Runner-up. All three will be notified by Monday April 5, 2018. Next comes the National Level. This level is scored only by judges and is not a public vote. Each contestant who wins their state will then be judged by a panel of judges. The judges will score each state winner as follows: Beauty and Poise 50% and Charity and Fundraising 50%. The National Winner, 1st Runner-up and 2nd Runner-up will be notified by April 8, 2018. Prizes for the winner include a sash and a crown. It also includes hundreds of dollars in prizes including a $500 gift card to Toy R Us, a gifted sponsored by Nova Derm Institute. "We are very excited about sponsoring the Little Miss North America. As a women-owned business owner, I like to make it a point to inspire young girls to dream big, work hard and give back. This contest gives them the opportunity to do all three," states Dr. Afsheen Ather. Visit An (http://www.aoagwllc.com/) Officer and Gentlewoman, LLC website for more info.